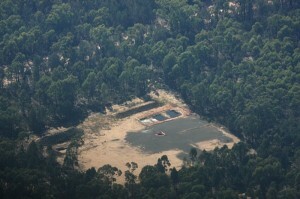 Fig 1 shows how the site of Eastern Star Gas’s Lateral Production Pilot Dewhurst 8 complex on private land looked prior to the start of their drilling for Coal Seam Gas in late May 2009. The first well drilled (Dewhurst 8)is the hole just to the left of the straight fence line (see fig 2a). A road 20 meters wide was cleared down the top fence line for a distance of 1200 meters and then access from this boundary road to the well site was by the slightly improved existing property track. The size of this well pad ws supposed to be 100 meters by 80 meters, however the actual cleared area is considerably larger. Fig 2a shows the 2 well sites that are photographed in the Article “Overflow Event 2009/2010”, and the bush between their adjacent corners,and going to the cleared patch on the right of the photo is where the water was flowing once it left the well sites. In fig 2a there is cleared ground to the right and 3 well sites ( Dewhurst 18H[bottom], 17H[middle] and 16H[upper])plus a dam to the left as well as a cleared road in the front along the fence line, the width of this road is again approximately 20 meters and again is about 1000 meters long. The Dam was not in the REF and has not been found in any amendment, of which there are none. 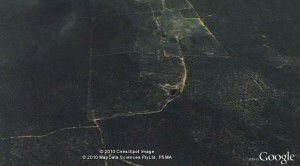 In fig 1 there is a dam, shown by a blue dot, this dam is located in the lower right corner of the extensively cleared area on the right of the photo,and both the green and brown coloured areas were cleared to make a new dam site to receive the “treated” water produced from the entire site. 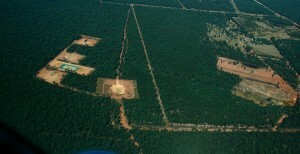 The area of the 3 wells on the left was to be 100 meters by 80 meters each. No Dam is mentioned in the REF and no amendment to the REF can be found( as of the date of posting this article. Fig 2b shows the 3 Vertical wells Dewhurst 13,14,and 15 as well as a large cleared area extending off Dewhurst14, this area is where the two (2) water treatment dams as well as the treatment plant and gas flaring equipment are going, with the final “treated” water going into a dam in the cleared area to the left as previously mentioned. Again the area of each well is 100 meters by 80 meters while the additional cleared area is supposed to be 5 hectares. The cleared space on the right and slightly above the wells is supposed to be for a erosion control dam. The boundary road on the right is approximately 1600meters long and 16meters wide, and was cleared to allow access to all the wells, making the originally cleared roads redundant. Eastern Star Gas, in the REF,p7, clearly states and I quote ” The total area of land impacted by this activity will be a maximum of 10 hectares in total; six well pads of 100 meters by 80 meters ( total 4.8ha) and up to 5 additional hectares of operational lands for water and gas management facilities.” end of quote. As can clearly shown by figs1, 2a and 2b this is not the case, even after allowing an extra 1ha for Dewhurst 8 that makes a total of 16ha and SORE estimate that at least an area of twice that size has been cleared,and SORE has not included the roads which total approximately an extra 4 ha thus bringing the total to around 35-40ha cleared. Eastern Star Gas states in the REF p15 and I quote:”The property was most recently cleared of native vegetation approximately 30 years ago and much of the remnant consists of the mid and lower strata regrowth with only scarce over story species” end of quote. The question is: Who cleared the extra and why? Was it done by Eastern Star Gas? We already know from the REF that Eastern Star Gas has shifted the location of Dewhurst 15 from being well in the neighbouring property, back into the private land supporting the rest of the complex for that can clearly be seen by looking at p16 of the REF and then Figs 1 and 2b. Fig 3 is of Dewhurst 11 and clearly shows the Drilling fluid dams and the well head the size of the Core Hole site to be larger than 50 meters by 50 meters. This Core-hole was completed in early November 2009 as was supposed to be Rehabilitated and the site restored at the completion of drilling. To-date that has not occurred and this well is not alone in that. There are at least 8 Core-holes that SORE knows of that Eastern Star Gas has failed to complete its written obligations. So why are Eastern Star allowed to get away with this? Eastern Star gas has many questions to answer but they are not alone DECC, the Department of Industry and Investment and the Namoi CMA all must be asked why? Why was extra clearing carried out especially given the stated age of the regrowth, 30 years, that would put the clearing well outside of 1990? Why has Eastern Star Gas not rehabilitated redundant roads in the Dewhurst 8 Lateral Production Pilot Site and other areas it is finished with? Why is Eastern Star Gas not Rehabilitating the completed Core Hole sites as per Eastern Star Gas’s own written word given and accepted by the Minister Mr Ian Macdonald? Surely he is an honorable man who would not like to see his name sullied by a company that does not honour their own written word, or does Eastern Star Gas only honour the spoken word as is the way of the Petroleum Industry? Come on Mr J Anderson you say I don’t know what I am saying and that I don’t have the facts lets hear from you. 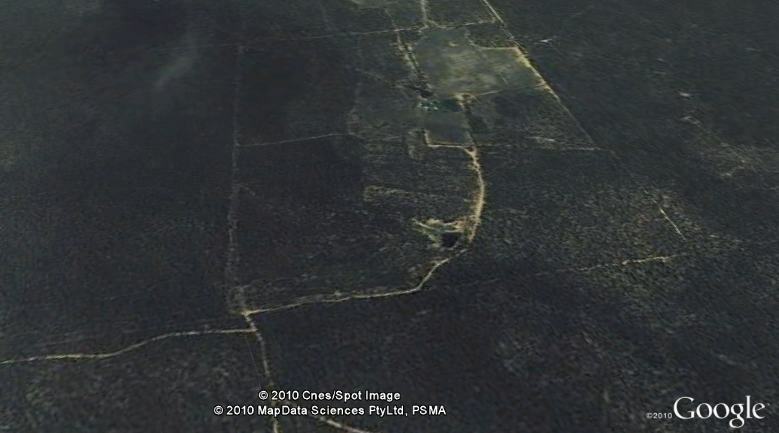 Google Earth for satellite photo.